Could a distant galaxy be home to a large population of unbound planets? 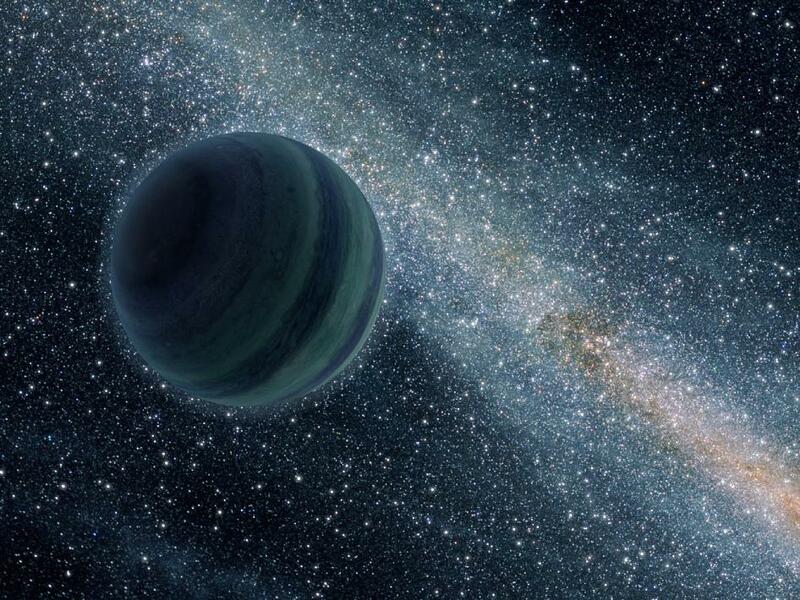 Astronomers have identified a population of rogue planets – planets not bound to or orbiting parent stars – in a lensing galaxy sitting between Earth and a distant quasar. Discoveries of exoplanets in our galaxy exceed 3,700 to date, but if that’s not enough for you, astronomers are now probing outside of the Milky Way to find exoplanets in other galaxies. A group of researchers at the University of Oklahoma has just announced the discovery of a large population of free-floating planets in a galaxy 3.8 billion light-years away. Their results were published February 2 in The Astrophysical Journal Letters. The researchers used a method known as quasar microlensing, which has traditionally been used to study the disk-like regions around supermassive black holes where material gathers as it spirals in toward the event horizon. Credit: NASA/Jason Cowan (Astronomy Technology Center). When a distant quasar is eclipsed by a closer galaxy, the intervening galaxy will create several magnified replica images of the quasar. These replicas are further magnified by stars in the interloping galaxy to create a final super-magnified image that can be used to study the quasar in detail. 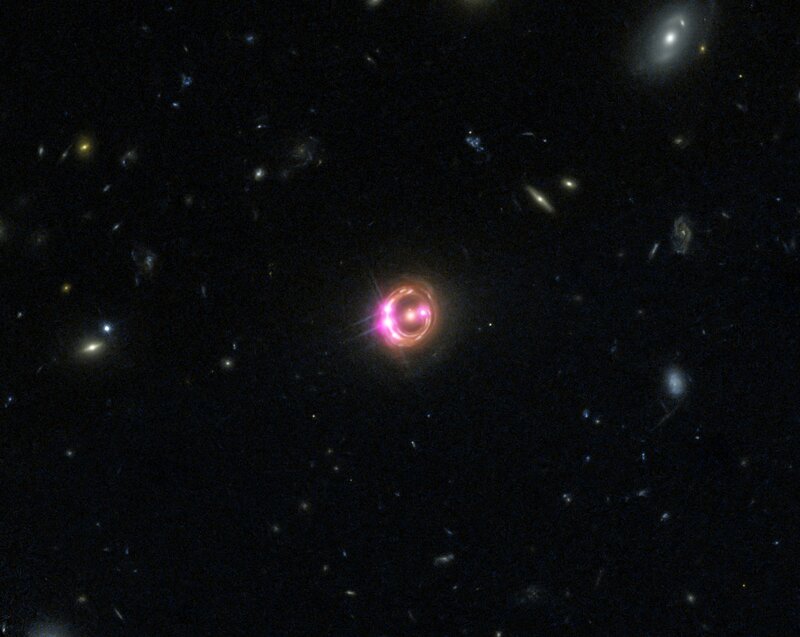 While studying the light emitted by the lensed quasar RXJ1131−1231 with the Chandra X-ray Observatory, the researchers noticed a particular wavelength of light emitted by iron was stronger than could be explained solely by the lensing effect of stars in the intervening galaxy. By modeling their results, the researchers concluded that the shifted energy signature was most likely caused by a huge population of planets with masses ranging from our Moon to Jupiter. The model that best matched the data found a ratio of 2,000 planets for every main sequence star in the galaxy —billions of stars. These planets are specifically “unbound” — not orbiting a star but wandering freely — as bound planets don’t have the same boosting effect seen in the data. Because the models only provided a wide range of potential planet masses, the researchers hope to identify the distribution of the sizes further with additional modeling. RX J1131-1231 is about 6 billion light-years away. It is a lensed quasar; gravitational lensing caused by an intervening elliptical galaxy (center, yellow) has magnified and multiplied the image of RX J1131 into four images (pink) as seen with the Chandra X-ray Observatory. This isn’t the first time astronomers have claimed a discovery of an exoplanet outside our galaxy. A signature consistent with a three-Earth-mass planet was detected in a galaxy 4 billion light-years away, but the one-time chance nature of the alignment causing the microlensing meant the discovery could not be confirmed with further observations. Similarly, a different version of microlensing using a star instead of a galaxy was previously used to probe the Andromeda Galaxy. A team found deviations in the light that they believed could be caused by an exoplanet six times as massive as Jupiter, but again the detection was never confirmed. The interloper star HIP 13044 was reported to itself host an exoplanet 25 percent larger than Jupiter, but subsequent follow-up found no evidence for the planet. Though this star is currently a part of the Milky Way, it originally came from a small galaxy that collided with the Milky Way six billion years ago. Vagabond stars like HIP 13044 may provide our best chance for examining exoplanets from other galaxies in detail. With current telescope technology, microlensing can point to a detection in other galaxies, but it cannot fully probe the properties of these candidates. Finding relatively nearby exoplanets around stars that originated abroad, however, may help us learn more about how exoplanets form and whether there are differences between planets born in different galaxies. A new study suggests that the gravitational waves detected by the LIGO experiment must have come from black holes generated during the collapse of stars, and not in the earliest phases of the Universe. The nature of the dark matter which apparently makes up 80% of the mass of the particles in the universe is still one of the great unsolved mysteries of present day sciences. The lack of experimental evidence, which could allow us to identify it with one or other of the new elementary particles predicted by the theorists, as well as the recent discovery of gravitational waves coming from the merging of two black holes (with masses some 30 times that of the Sun) by LIGO the Laser Interferometer Gravitational Wave Observatory) have revived interest in the possibility that dark matter might take the form of primordial black holes with masses between 10 and 1000 times that of the Sun. Primordial black holes, which would have originated in high density fluctuations of matter during the first moments of the Universe, are in principle very interesting. As opposed to those which form from stars, whose abundance and masses are limited by models of stellar formation and evolution, primordial black holes could exist with a wide range of masses and abundances. They would be found in the halos of galaxies, and the occasional meeting between two of them having masses 30 times that of the Sun, followed by a subsequent merger, might have given rise to the gravitational waves detected by LIGO. If there were an appreciable number of black holes in the halos of galaxies, some of them intercept the light coming towards us from a distant quasar. Because of their strong gravitational fields, their gravity could concentrate the rays of light, and cause an increase in the apparent brightness of the quasar. This effect, known as “gravitational microlensing” is bigger the bigger the mass of the black hole, and the probability of detecting it would be bigger the more the presence of these black holes. So although the black holes themselves cannot be directly detected, they would be detected by increases in the brightness of observed quasars. On this assumption, a group of scientists has used the microlensing effect on quasars to estimate the numbers of primordial black holes of intermediate mass in galaxies. 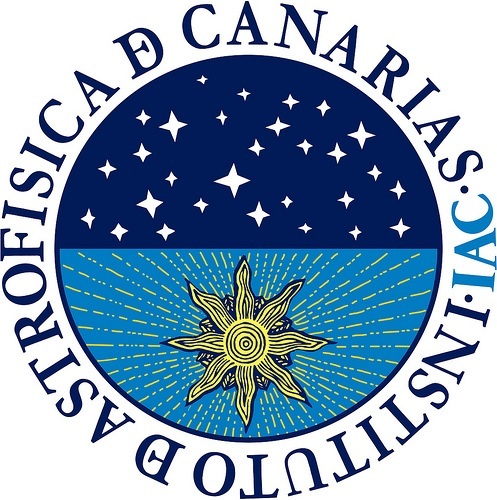 The study, led by the researcher at the Instituto de Astrofísica de Canarias (IAC) and the University of La Laguna (ULL), Evencio Mediavilla Gradolph, shows that normal stars like the Sun cause the microlensing effects, thus ruling out the existence of a large population of primordial black holes with intermediate mass. 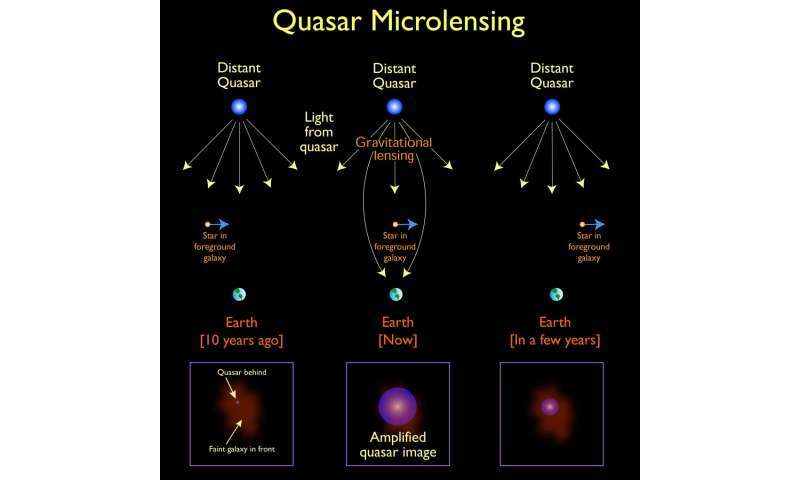 Using computer simulations, they have compared the rise in brightness, in visible light and in X-rays, of 24 distant quasars with the values predicted by the microlensing effect. They have found that the strength of the effect is relatively low, as would be expected from objects with a mass between 0.05 and 0.45 times that of the Sun, and well below that of intermediate mass black holes. In addition they have estimated that these microlenses form roughly 20% of the total mass of a galaxy, equivalent to the mass expected to be found in stars. So their results show that, with high probability, it is normal stars and not primordial intermediate mass black holes which are responsible for the observed microlensing. “This study implies “says Evencio Mediavilla, “that it is not at all probable that black holes with masses between 10 and 100 times the mass of the Sun make up a significant fraction of the dark matter”. For that reason the black holes whose merging was detected by LIGO were probably formed by the collapse of stars, and were not primordial black holes”. Astronomers participating in this research include Jorge Jiménez-Vicente and José Calderón-Infante (University of Granada) and José A. Muñoz Lozano, and Héctor Vives-Arias, (University of Valencia). Article: Limits on the Mass and Abundance of Primordial Black Holes from Quasar Gravitational Microlensing, by E. Mediavilla et al. Published in The Astrophysical Journal Letters. Reference: E. Mediavilla et al 2017 ApJL 836 L18. The IAC is also involved in researcher training, university teachingand outreachactivities.